Filling nozzle, the right equipment for the job. Now that I have become quite, quite obsessed with eclairs and profiteroles, I realised quite quickly that I was lacking a vital piece of kit. A piping nozzle that was long enough and thin enough to penetrate the choux pastry, but with the hole large enough to let the cream out. Cheap icing/piping nozzles are a false economy because the really good ones don’t cost that much, about £4-£5 a piece. And most people don’t need that many nozzles because they don’t ice/pipe much. So you don’t need a payday loan to fund this particular habit. And if you do ice/pipe a lot then you must surely appreciate the benefit of having good tools. Anyway, the one for this job is the Wilton Tip 230. It’s available in lots of places for £4ish. But you can also get this kit for not much more, £6.27 at time of writing, and yet you get four Wilton nozzles and some disposable icing bags. NOTE: the description says ’12 piece set’, well it is if you count the icing bags but you only get four nozzles. One of which is the filling nozzle. So if you don’t want to slice your eclairs or profiteroles, you simply make a little hole with a skewer or some such, insert this and squeeze the cream in until it starts to come out. It is a bizarrely satisfying ritual, which probably says something more about me than I should let on. 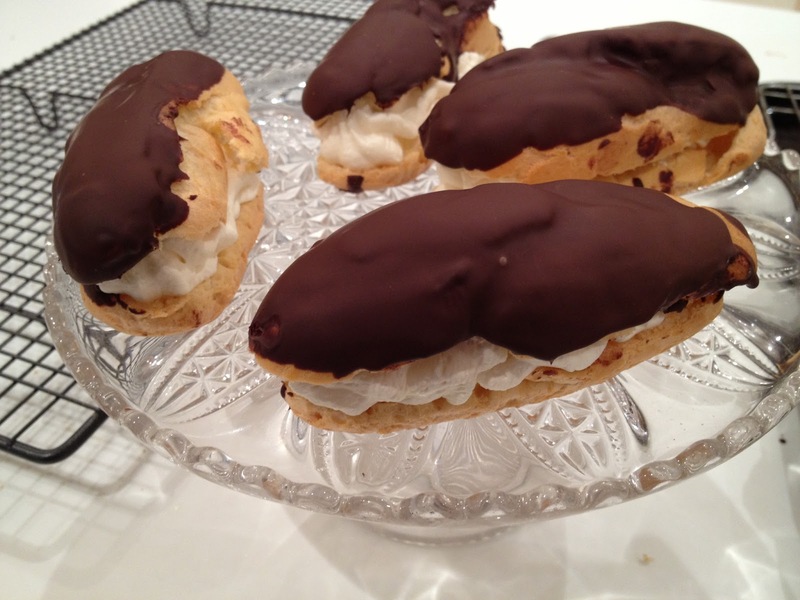 This entry was posted in Consumer, Equipment, Patisserie and tagged eclairs, filler nozzle, piping nozzle, profiteroles, wilton's on March 11, 2013 by Annalisa Barbieri. Here is a confession. I really am not that into eclairs. I know people who go cuckoo for them. Not me. I’m not overly a fan of choux (unless in a Paris Brest), nor whipped cream. Basically, eclairs aren’t piggy enough for me. As I got older, and everyone went on about how hard choux pastry is, well that, coupled with my slight meh-ness towards them…meant I didn’t really try. My children love eclairs so I decided to give them a go. They were easy. So easy I was expecting the sky to fall in. I’d love to hear how you customise them. pinch of salt (I think this is key, choux is pretty tasteless, but the salt adds something). I just used double cream, about 300ml, whipped up with a spoon of vanilla essence and a tablespoon of icing sugar. Or try delicious white chocolate cream, which is what I use as a default filling these days. I used 150g 70% cocoa chocolate and a teaspoon of vegetable oil, melted in a bowl, over a pan of boiling water. Then manually just dipped the eclair tops in and set them down on a cooling rack. Hardly any drips..
Obviously with both filling and topping you can change it. Next time I’m going to try something a bit more adventurous. You also need a piping bag and plain nozzle of about 1cm diameter. A baking tray and some baking parchment. Put the water and butter in a sauce pan and cook over a high heat. Stir until butter is melted and bring to the boil. When this happens, lower the heat and add in the flour. Beat with a wooden spoon until smooth and the mixture leaves the sides of the pan. For me this happened almost immediately. Remove from the heat. Now. Some recipes say to let the mixture cool and then add the eggs. I can only tell you how I did it which was to add the eggs straight away to the mixture, once in the electric mixer bowl. So. Put the butter/water dough in an electric mixer with the whisk attachment and add the eggs one at a time. This is the important bit. After you’ve added the first egg, the mixture must be absolutely smooth before you add the next egg. At first the mixture seems to curdle, more so if your butter/water dough is hot and the eggs are very cold. It will look like scrambled eggs. You will want to cry. Don’t. And don’t panic. Keep mixing. It will eventually blend together and go smooth. Honestly mine took a good five-ten minutes during which I started to panic and think “why the hell did I not LISTEN to everyone who told me choux pastry was so hard.” Keep the faith. Keep mixing. It will smooth out. Then, add the next egg and mix until smooth and then the next one. I added the salt with the third egg. No idea why just did. The mixture is ready when you lift the whisk and it leaves ribbon marks – indentations in other words. Put into the piping bag. I find it useful to a) use a clip to secure the top of the icing bag – just above the nozzle – so that the mixture can’t ooze out. By clip I mean like those Klip-it things you use to keep food in a plastic bag fresh. b) put the bag in a tall glass and fold the top of the bag over so you can spoon the mixture in. Obviously when you are ready to pipe, you take the Klip-it off. This mixture pipes really beautifully, so pipe eclair shapes (or profiterole shapes) onto the tray, leave a good gap as they do grow. Put in the oven. I cooked mine for 30 mins and they were perfect, dry and crispy. 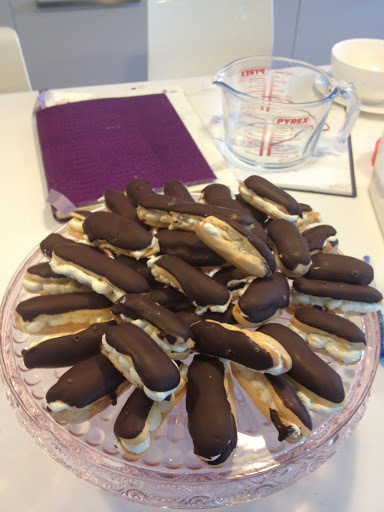 My patisserie expert said that’s how high quality eclairs should be – kinda dry and not soggy like shop bought ones. You can’t really overcook eclairs (well, actually you can but you know…). I cooked some profiteroles another time and gave them 35 minutes and they were fine. Don’t be tempted to open the oven at all if possible and certainly not before about 25 minutes. They should be puffed and golden. Mine were almost empty inside. There was no need to dry them out inside as some recipes suggest, by placing them back in an oven. I just cut them lengthways when they were completely cool and did the topping first (put the topped eclairs in the fridge for five mins to make the topping set if you’re in a hurry), then I added the cream with another piping bag (I was piping bag mad by this stage). They all got eaten that day. And when I served them the second time round, because I had some salted caramel left, I added a dollop of that in too. I am salted caramel crazy though. The reason I’m writing about these is that they were so easy and the return to effort ratio so madly unbalanced in favour of the return part, that I did wonder why I had left it so long. Update on 6th March 2013. I thought it might be useful to have some troubleshooting here. There are a couple of key important bits in making eclairs. The bit in the saucepan, with the flour and the butter/water…make sure you really dry this mixture out. By that I mean, even when it starts to come off the sides, keep going for a minute longer. The more you dry it out now, the more eggs you will be able to add (more on this later). The more eggs you can add, the more the eclairs will rise. What do you mean, the more eggs I can add? Don’t you say three eggs? Yes, yes I do. But here’s the other thing. I make this all the time with three eggs but mine are medium (in fact I’ve altered the recipe above to say this). Eggs differ in size, although it’s usually the amount of white in an egg that differs between the different sizes. So if you were to crack open a medium and extra large egg, the real difference is in the white, not the yoke. Anyway, when you’re at the adding the eggs stage, if you’re new to this, I’d whisk up the third egg before adding it and then add it a bit at a time. What you want is a mixture that’s thick. Don’t be afraid to give it a really good whisking, don’t stop just the moment you think it’s done. You want the mixture to be able to stand in stiff peaks. If it’s not thick enough at this stage, it won’t get any thicker at the piping them out stage. So when you stop whisking you need to be absolutely sure it’s thick enough, otherwise, you pipe it the eclairs will spread. If you add too much egg, then the mixture might get too sloppy which is why I recommend adding it in stages if you’re new to this. Should I cool down the butter/water/flour mixture before putting it in the mixer? Almost every recipe tells you to do this, to cool it down otherwise it will cook the eggs. I don’t. I know, madness, but I’ve tried it both ways and for whatever reason I’ve found that if I add this to the mixer and add the eggs straight after the sauce pan stage, my eclairs rise more. Yes you do need to beat the first egg in for much longer and it will go through a scrambled egg phase. Try it whichever way you want and see how you go. I’m fairly brave with patisserie making so I like to fly by the seat of my pants. You may want to go more slowly. Both are fine approaches. If you’d like more ideas about what to fill them with, other than cream: chocolate ganache filling recipe here; white chocolate cream filling here (this is YUM). And not long after I originally wrote this I stopped cutting the eclairs in half and instead using a piping nozzle to fill them. This entry was posted in Celebration, Chocolate, Patisserie, School fete and tagged chocolate, cream, eclairs, piping on January 23, 2013 by Annalisa Barbieri.